A council which provides just one bin to homeowners is considering moves to give out five new waste containers. Last year a survey found Dumfries and Galloway Council was one of just two authorities in the UK which only collect a single bin. Proposals have now been tabled to give out five new bins to handle different kinds of waste. The changes are designed to meet targets set as part of the Scottish government's Zero Waste policy. The move comes three years after the local authority scrapped its "blue box" paper recycling scheme. 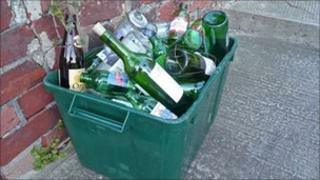 A report to councillors advises reintroducing kerbside recycling in Dumfries and Galloway. It would cost almost £4m to implement, including the purchase of new collection vehicles and household bins. Of that total, the council would have to meet just under £800,000, with Scottish government funding covering the rest of the bill. However, the local authority is being warned that depending on future grant support, it could face an increase in running costs of just over £400,000 a year. Householders would also receive a supply of biodegradable bin liners for food waste. As part of the proposed move to a kerbside service, all existing recycling points at supermarkets and in car parks would be removed and the council would have to renegotiate its deal with waste management contractor Shanks. It has been estimated the new service would create 39 additional jobs. What do you put in nine bins?